The U.S. District Court for the Western District of North Carolina uses the Jury Evidence Recording System (JERS) to capture evidence electronically during a trial. The Court provides evidence presentation equipment to any member of the bar practicing within the western district of North Carolina. A training session on the use of this equipment can be requested here . How to Submit Electronic Exhibit Files Electronic evidence files shall be provided on a USB drive, DVD, or CD, in an unencrypted format. Regarding the file size of electronic evidence, individual files should not exceed 500MB. If possible, exhibits approaching or exceeding this size limit should be separated into multiple files. Note, PDF documents can often be reduced significantly in size by using tools such as Adobe's "Reduce File Size" feature. Images can be significantly reduced in file size by lowering its resolution or dimensions, usually with minimal affect to viewing quality. Exhibit Formatting Instructions for Batch Importing Exhibit files can be formatted in a manner that permits them to be batch imported into the JERS system. The two methods used are described below. One of these two methods must be used. • All files are provided on a single storage device such as a CD, DVD, or USB drive. • Along with the exhibit files, a text delimited index file named Exhibits.txt is also required. • The use of the “underscore” character is required when an optional description of the exhibit is included and cannot be used elsewhere in the exhibit name. 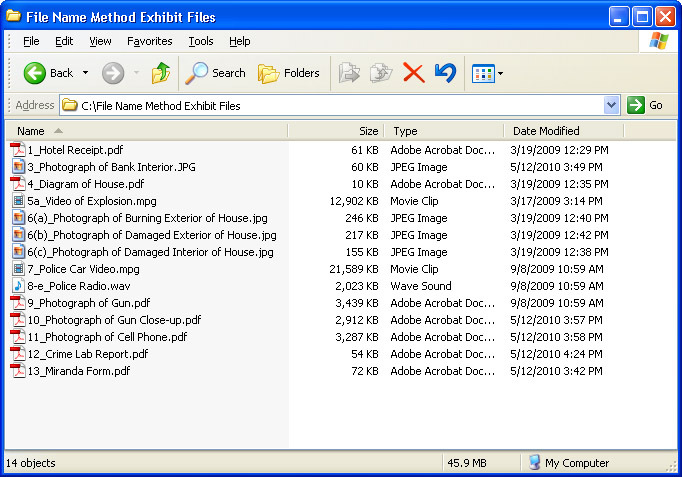 (a sample listing of exhibit files using the File Name method can be viewed here.